Now that you've learned how to trigger a state change, let's explore how to create interactive content using slide layers and triggers. Slide layers are a great way to display additional content in response to a learner's actions. In this exercise, we’ll start by creating a layer to display a video with additional information. Then we’ll create the triggers for opening and closing that layer. Open the 03B_Triggers_Layers.story file from the Storyline_Files folder and go to slide 1.2 Practice. Create a new slide layer and retitle it as Video. Go the the Insert tab and insert the CSR Fundamentals Class video from your Assets folder onto the Video layer. Size and position the video however you like. Next, we’ll create a trigger to display our video layer when a user clicks a button. 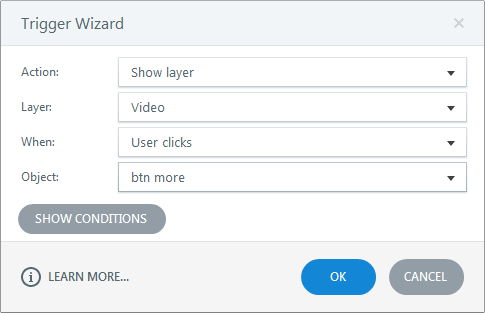 On the base layer, create a new trigger that shows the Video layer when the Learn More button is clicked. Preview the slide to see how it looks. Notice how the elements from the base layer are visible and distracting from the video on our layer. To prevent certain base layer objects from being visible when the Video layer is displayed, go to the timeline on the Video layer and expand the base layer group. Use the Show/Hide button to hide everything on the base layer except the Title. You should have a screen that looks similar to the one shown below. Preview the slide to see what it looks like. Our last step is to add a button that hides the video layer and returns us to the starting point. On the video layer, insert a shape near the top-right corner of the video. You can use any shape you like. The multiply shape in the Equation section is a good option. Since it's a good habit to follow, use the timeline to rename the shape to something that will help you easily identify it. We're using btn layer. Create a new trigger that hides the video layer when the shape is clicked. Preview the slide to make sure everything is working. By building this simple interaction, you've learned the basics of working with slide layers and triggers. Now it's just a matter of practicing and applying this to your e-learning courses. In the next tutorial, you'll learn how to add interactivity with triggered motion path animations.